A Solar Panel For Charging Laptops, Tablets, Camera Batteries, Smartphones and More! In today’s video I’ll be talking about the Voltaic Fuse 10 Watt Solar Changer. This is an amazing little solar charger that allows you to power and recharge laptop batteries, DSLR camera batteries, tablets, smartphones, handheld gaming devices, GoPro video cameras, and a whole lot more. What you’ll see in the video above is the solar kit, which consists of three smaller solar panels, which combine to a total of 10 total watts. On the front of the Fuse there is also a red LED indicator light, which tells you whether or not the panels are getting any sun. On the backside of the Voltaic Fuse are a number of different straps that you can use to attach this particular solar kit to a backpack, bicycle, motorcycle, kayak, canoe, tent, or anything else you might possibly imagine. There’s also a small hole down at the bottom of the Fuse 10 Watt (on the backside), which allows you to run a cable outside of the bag and charge electronic devices outside of the kit itself. Finally, there is a big, long zipper that runs along the outside of the bag. Inside the Fuse is the interesting part. On the front side of the Fuse’s carrying case are the mounted solar panels and the circuit box, which runs between the three solar panels on the front of the Fuse, and the large, internal battery. And on this circuit box, which you can run at 6 volts or 18 volts, are two different cables: one that goes into the battery and charges the battery… and one that can be used to charge certain electronic devices directly. The power, which is generated by the sun, then runs from the three panels on the front of the Fuse, through the circuit box and into the battery. Then you use the battery to charge whatever electronic items you might be carrying with you. There are a number of different inputs and outputs on the battery itself. There is the main input, where the power comes in from the solar panels themselves. There is an output, which is used to power larger devices, like a laptop computer. There is a toggle which allows you to run the battery at 12 volts, 16 volts or 19 volts. And there is also a USB output port, which is used to charge smaller electronics, like smartphones, GoPro video cameras, etc. Inside the rest of the Voltaic Fuse 10 Watt solar charger kit are a number of different adapters that are included for free with the kit. There are laptop adapters, USB cables, a car charger adapter, and a charger that allows you to quickly charge the battery by plugging it into a wall outlet. I have also purchased a small additional cable which allows me to charge my 13″ Macbook Pro with the Voltaic Fuse 10 Watt Solar Charger. How Well Does The Voltaic Fuse 10 Watt Work? One of the great things about all of Voltaic’s solar chargers is that they make it really easy for you to tell whether or not the device is actually working. I know that sounds obvious, but with a lot of other solar charger products, you have almost no idea whether or not your electronics are actually being recharged when the product is in use. But with Voltaic, they’ve made it really easy for you to tell whether or not the chargers are actually doing the job they’ve been designed for. As I already mentioned, there is a red indicator light on the front of the Fuse bag, which lights up when the panels on the front of the Fuse are getting any sun. When you look at the battery, however, there are five little red indicator lights. These five lights will light up when the battery is actively being charged. When the lights are moving, you know that the solar panel is doing what it’s meant to do. You can check the status of the battery at any time during its charging state by simply pressing the button on the outside of the battery. Once you do that, the battery’s indicator lights will light up and pause at a particular series of lights. In the video above, when I press the battery button, the first three lights on the battery light up. This tells me that the battery is approximately 60% full (or charged). So, these red indicator lights, depending on which lights turn on when the battery button is pressed, tell you whether the battery is 20%, 40%, 60%, 80% or 100% full. This is a great feature to have on a solar device such as this… and is incredibly valuable when you are out on the road and you want to know how much more sun your solar charger needs to get until the battery is full. Now let’s say that you want to charge a smartphone with the Voltaic battery that comes with the Voltaic Fuse 10 Watt solar charger kit. To do this is really easy! All you do is take your smartphone and the USB cable that came with your smartphone and plug the USB cable into both your smartphone and the Voltaic battery’s USB output. Once you’ve done that, your phone will start charging! It’s really that easy. With my smartphone (the Samsung Galaxy S4 mini), it takes me about 2.5 hours to fully recharge the phone from the Voltaic battery. Another thing you can do is, you can take the battery and the smartphone that you are now charging and place them both back inside the Voltaic Fuse case. You can secure the phone inside the internal pocket so that it is extra secure, and then you zip up the entire Voltaic case. Now the whole thing is secure so that once you hit the road, the battery, your phone and all your accessories are inside this one easy-to-carry case, and the battery continues to charge while your phone is being recharged as well. I should tell you that on the Voltaic battery there is an option to run the battery at 12 volts, 16 volts or 19 volts… and depending on the type of device you are wishing to charge, you will want to change the voltage output on the battery. On my MacBook Pro, I run the battery at 16 volts, but this may differ for you and the device you are wishing to recharge. After plugging the Voltaic battery into your laptop computer, you can look on your laptop and see that the laptop is now running from the Voltaic battery. On my computer, the power source is listed as “Power Adapter” when it is connected to the Voltaic battery. So, the power source is no longer running off the laptop battery. It is now running off the Voltaic battery, which the computer doesn’t know is actually a battery and not a regular wall socket. Would I Recommend The Voltaic Fuse 10 Watt Solar Charger? Yes! Absolutely! The great thing about the Voltaic Fuse 10 Watt Solar Charger is that it is so powerful. If you have a laptop computer, a DSLR camera, a tablet or any larger electronic device that you want to charge, this is probably the solar charger you want to get. The downside to this particular product is probably its size and weight. 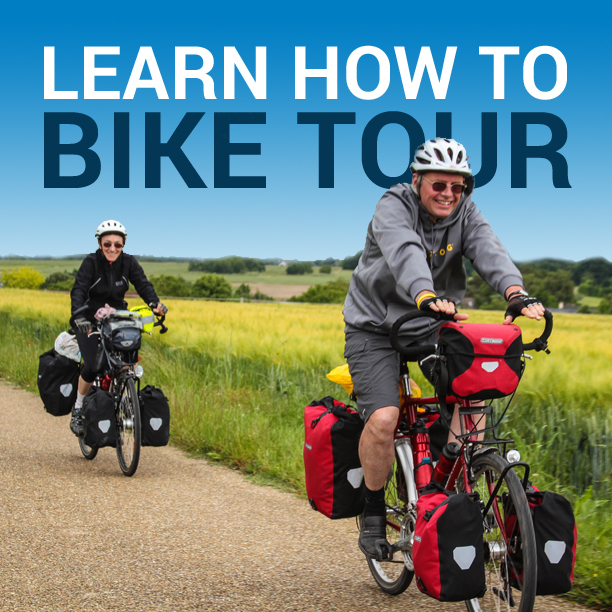 If you are hiking or biking, this is a little bit on the big size to carry with you. It’s certainly possible to carry, but not exactly ideal. If you compare the Voltaic Fuse 10 Watt to the Voltaic Fuse 4 Watt, you can see that the 10 Watt is quite a bit larger. Of course, the 10 Watt is also a whole lot more powerful. The 4 Watt is not capable of charging a laptops, camera batteries, etc. The 4 Watt is more for charging smartphones, GoPro video cameras and mP3 devices. The larger 10 Watt Fuse is what you need to charge laptops, tablets, etc. Size and weight are something to consider, but if you need power, this is it! 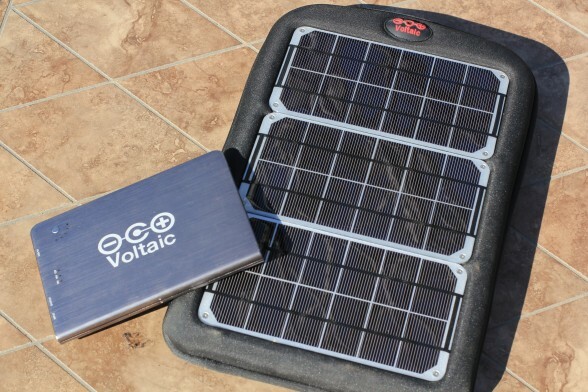 The Voltaic Fuse 10 Watt Solar Charger. This entry was posted in Bicycle Touring Pro Articles, Electronics, Featured Articles, Product & Service Reviews, Products, Videos and tagged 10 watt solar charger, bicycle touring solar charger, bike tour solar charger, dslr camera battery charger, fuse solar charger, gopro solar charger, laptop solar charger, solar charger built for a bicycle, solar charger for camera, usb solar charger, video camera solar charger, voltaic, voltaic fuse 10 watt, voltaic fuse solar charger, voltaic systems. Hi Darren . How weather / waterproof have you found it to be ? Thanks . Happy travels . Adam. During most rain storms I simply leave the Voltaic Fuse strapped to the back of my bike and I dont worry about it. It is really quite water-resistent. But when it really starts to downpour, I put it inside on of my rear panniers… just in case. You dont have to worry about getting the solar panels wet. They are designed to get wet. But the battery should not get wet. That is the important part. Woooow……How to get the voltaic fuse 10 watt? Could find out in Indonesia? Thanks . Really starting to think it’ll be good for my upcoming , year tour of my home , Australia . I can’t seem to find a better alternative . Weight may be an issue . Happy travels . You mention how long it takes to charge a Samsung S4 and a laptop from 73% from the battery, but how long does it take to charge the battery on a sunny day and how many times would the full battery charge your Samsung S4 from no charge? I’m not sure I am able to answer all those questions as scientifically as you would like. I wish I were at home and had the proper electrical testing instruments available so I could tell you exactly how much electricity the panel produces when it is in direct sunlight, cloudy weather, etc. To answer your second question, the battery I have on my 6 Watt panel charges my Samsung mini smartphone about 2.5 times if it does not receive any additional recharging from the sun. Great article and video, very helpful and provided all the answers to a problem I have been researching for ages. I have now ordered my Voltaic 10W solar charger and look forward to strapping it on the back of my bike and hitting the road.